In a fundamentally competitive world marked by assertive advancement of national interest, India has stood out over the past six decades for not learning from mistakes and continuing to operate on ingenuous premises. Spanish-born US philosopher George Santayana’s saying is particularly applicable to India: “Those who cannot remember the past are condemned to repeat it.” Ad hoc, personality-driven policymaking has long been India’s curse. Pakistan, although widely perceived to be a failing state, is still able to outwit India diplomatically. It is India, not Pakistan, that has climbed down diplomatically and sought a cricket-inspired thaw in bilateral relations. In fact, India has again demonstrated its inability to stick to its stated position. The new bonhomie with Pakistan in the form of cricket diplomacy actually mocks the memory of those killed in the 2008 Mumbai terrorist siege that was planned on Pakistani soil. Pakistan not only has done nothing to bring the perpetrators of the Mumbai attacks to justice, but has also managed to get India to unconditionally resume dialogue at the highest level. Singh was clearly motivated by a desire to divert attention away from a series of scandals that have destabilized his government and tarnished his reputation. So desperate was Singh to get a Pakistani leader to come to Mohali that he invited both President Asif Ali Zardari and Prime Minister Yousaf Raza Gilani. Although Gilani effectively ranks No. 4 in the Pakistani power hierarchy after the Army chief, ISI chief and president, Singh and Sonia Gandhi leaned over backward to treat him as if he were Pakistan’s real power wielder. Gushy expectations and wishful thinking have long blighted Indian foreign policy. In dealing with Pakistan, a succession of Indian leaders have assumed that the others do what they often do — jettison beliefs, perceptions and policies overnight. Singh’s initiative indeed serves as more evidence for Pakistan that Indian policy is inconsistent and confused and that there are no real costs to be paid for continuing to wage a “war of a thousand cuts” against India. Few things stir greater public passions in India than cricket and politics. And yet Mohali represented the third occasion when an Indian prime minister blended cricket and politics to court Pakistan since it launched a proxy war against India. It was Rajiv Gandhi who first politicized cricket by playing host to Pakistani military dictator Zia ul-Haq at an India-Pakistan match in Jaipur in 1987. 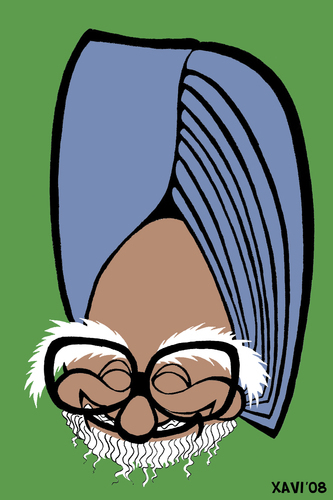 That example prompted Singh to similarly invite another Pakistani dictator, Pervez Musharraf, to a match in New Delhi in 2005. Tellingly, only India has practiced cricket diplomacy — that too to propitiate Pakistani rulers. Singh’s shifting policy on Pakistan has actually drawn encouragement from the record of his sphinx-like predecessor, Atal Bihari Vajpayee, under whose leadership there was a troubling lack of both consistency and clarity on how to deal with Pakistan. India’s roller-coaster policy on Pakistan between 1998 and 2004 exacted a heavy toll. In that period, personal rather than professional characteristics defined India’s shifting Pakistan stance, as the policy jarringly traversed through Lahore, Kargil, Kandahar, Agra, Parliament House, Srinagar and Islamabad. In a situation with no parallel in modern world history, much of the Indian military was kept in war-ready position for nearly 10 months by Vajpayee and then demobilized without any results to show. Vajpayee’s swinging policy pendulum undermined professionalism and institutionalized policy-making, and exposed India’s glaring inadequacy to set and unwaveringly pursue clear, long-term goals. Instead of replacing the cynicism that has now crept into the Indian system with a clearheaded, goal-oriented policy, Singh has gladly chosen to follow in Vajpayee’s footsteps. In fact, at a time when multiple scandals have engulfed his government, Singh was eager to shift the public spotlight to a big diplomatic initiative. So the entry of India and Pakistan into the World Cup semi-finals came as a godsend opportunity for him, although he is no great cricket fan. Singh’s unexpected gambit caught everyone by surprise, although impulsive moves (as Sharm el-Sheikh and Havana showed) are usually counterproductive to national interest. In diplomacy, preparatory work is a must. For example, the ping-pong diplomacy that jumpstarted US-China relations in the early 1970s was part of careful, two-year policy groundwork. Ping-pong with China, in fact, was just a cover for the US to quietly initiate an alliance with Beijing to contain the Soviet Union. Mohali, by contrast, represented a meeting of beleaguered leaders, bringing together two prime ministers that are politically wounded at home. The Indian and Pakistani governments are both battered by allegations of corruption, mismanagement and poor administration. Indeed, there is little prospect of any kind of breakthrough in India-Pakistan relations, given that Pakistan’s real power broker — army chief Ashfaq Parvez Kayani — is considered one of the most anti-India generals in his country’s history. Peace on the subcontinent thus remains as far off as ever. Dialogue between the two countries, in any case, is founded on conflicting expectations. India’s premise is that the process of dialogue will persuade Pakistan to cease sending armed terrorists into India and start building good-neighbourly ties. Pakistan, in contrast, has viewed the process as a means to nudge India to ‘make progress on Kashmir,’ a euphemism for Indian concessions. Singh, for his part, has refused to learn from his past blunders at Sharm el-Sheikh (where he included Baluchistan) and Havana (where he turned the terror sponsor into a fellow victim of terror by setting up the infamous Joint Anti-Terror Mechanism). But if he thought he could use the Mohali hoopla to distract the Indian public from the swirling scandals, he is likely to be disappointed. No political stunt can help defuse the public anger in India over mega-corruption. This entry was posted in Diplomacy by Chellaney. Bookmark the permalink.